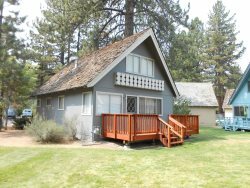 Highland Woods Chalet with 2 bedrooms, 2 baths plus loft. Only 3 1/2 miles to casinos and Heavenly Mountain Resort and 1.5 miles to the lake. Fully equipped kitchen. TV, VCR, Stereo. Gas woodstove. Linens provided, washer and dryer. No smoking and no pets.